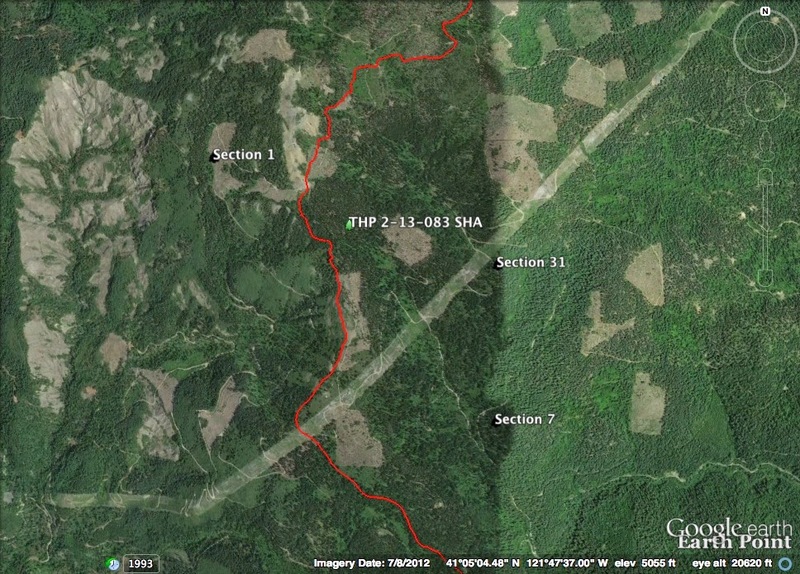 THPBlog: Sierra Pacific Industries to clearcut near the Pacific Crest Trail and Big Bend, CA. Sierra Pacific Industries to clearcut near the Pacific Crest Trail and Big Bend, CA. THP 2-13-083 SHA (Red Peavine THP) Sierra Pacific Industries, 378 acres; 85% clearcut, 12% shelterwood, 2% roadside logging. Curtis, Indian Creek, Rock Creek (MD: T37N R1E Sec.1; T37N R2E Sec.7; T38N R2E Sec.31). Winter operations, moderate erosion hazard, steep slopes up to 60%, unstable area, 11 road drainage work sites, impaired 303.d watershed, oversized units, herbicides, pacific crest trail, 1 spotted owl within 1.3mi, cascade frog sightings, trees up to 130 years old. Estimated public comment deadline: 12/04/13. This THP is about 7.5 miles NE of Big Bend, CA at an elevation of 4,600 to 5,700 feet. Sierra Pacific Industries is planning a mostly clearcut tractor and cable logging operation in white fir, sugar pine, Douglas fir and ponderosa pine forests. The Pacific Crest Trail, a popular hiking and backpacking trail runs within 300 feet of units 1C, 31A and 31K. There is an unstable area in unit 31E related to a stream undercutting a bank, and1.5 miles of new road construction is proposed. Sierra Pacific Industries wants to use 600 feet of a haul road within a watercourse, and use ground based equipment in units designated for cable logging in unit 7E. Eleven road drainage sites are proposed for work including rocking, dip construction, and culvert repair and/or replacement. Units 7C, 7E, 31E and 31D are oversized. There have been cascade frog sightings in tributaries below the THP area. One population of teasel was found near the boundary of unit 1B, several occurrences of upswept moonwart were found in units 7C & 31E, several occurrences of Mingan moonwart were found in Unit 31E, and 3 populations of western campion were found in unit 31H. More information is available on the THP Tracking Center website.